- 'stereo' caption on both sides of the spindle hole. - broad, not elongated label font. Both first (tan label) and second (red label) pressings released with an insert, a 10" x 10", 1-color lyric-and-credits sheet, printed on both sides. 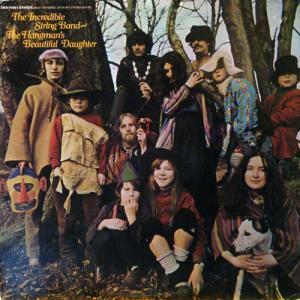 Over its near ten-year existence, The Incredible String Band revolved around the psychedelic folk of mainstays Robin Williamson and Mike Heron. In 1965, Williamson first teamed with Clive Palmer in Edinburgh, Scotland as a folk duo. The following year, they auditioned Heron and headed to London, where Joe Boyd signed them to Elektra Records. Their debut album was a traditional folk record, but earned accolades from Melody Maker. The trio then split. However, under Boyd's continued watch, Williamson and Heron reunited and released the more promising The 5000 Spirits Or The Layers of the Onion in July 1967. The record reached No. 26 in the UK charts and quickly The Incredible String Band became fixtures in the London underground. 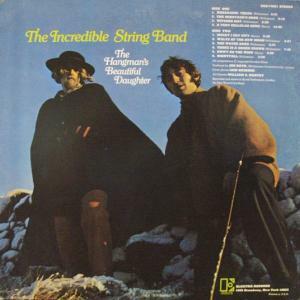 Their next album, The Hangman's Beautiful Daughter, saw release in March 1968. Heron's "A Very Cellular Song" is the album's crown achievement. The 13-minute song shifts between its different sections, whether the Bahamian spiritual "I Bid You Goodnight" or the closing "May the Long Time Sun Shine;" the interim section, "Amoebas Are Very Small," offers an account of mitosis! Another of the album's highlights, "Waltz of the New Moon," is all Williamson until Heron comes in on harpsichord. Both Williamson and Heron offer a uniquely emotive vocal delivery throughout, one that would offer a blueprint for artists such as Peter Hammill and Syd Barrett to follow. The album's seemingly Spartan arrangement is mostly a ruse; armed with a chestful of acoustic instruments, ranging from gimbri and sitar, whistle and Jew's harp, harpsichord and various percussion instruments, there's a trance-like quality to the album's many layers that captivates the listener. The album soared to No. 5 on the UK charts, and while only reaching No. 161 in the US; yet it earned a Grammy Award nomination. Later in the year, the duo released the double-album Wee Tam And The Big Huge, now with girlfriends Christina "Licorice" McKechnie and Rose Simpson in full-time roles. The Incredible String Band continued releasing albums throughout the early 70s until Williamson and Heron split in 1974. Both continued successful solo careers for many years.